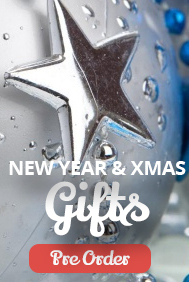 Are you looking for a gift that's a little bit different? 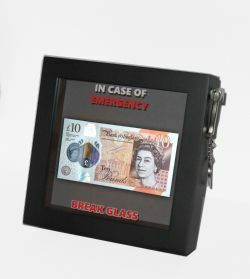 This Present Emergency Frame & Hammer is an ideal novelty gift for a Birthday/Christmas/Wedding or New Parent to name just a few. It allows you to put a person's favourite, must have, 'just in case' or can't live without item/items inside. Whether a Chocolate bar, their favourite drink or even money.... What better way to turn a simple gift into something more personal that will certainly raise a smile or two. Why not turn a significant gift into a fun one by placing gifts such as Jewellery, Mobile Phone, Gift Vouchers, Car Keys, Flight Tickets etc instead of using just an ordinary gift box. Make your gift all the more fun & enjoyable! 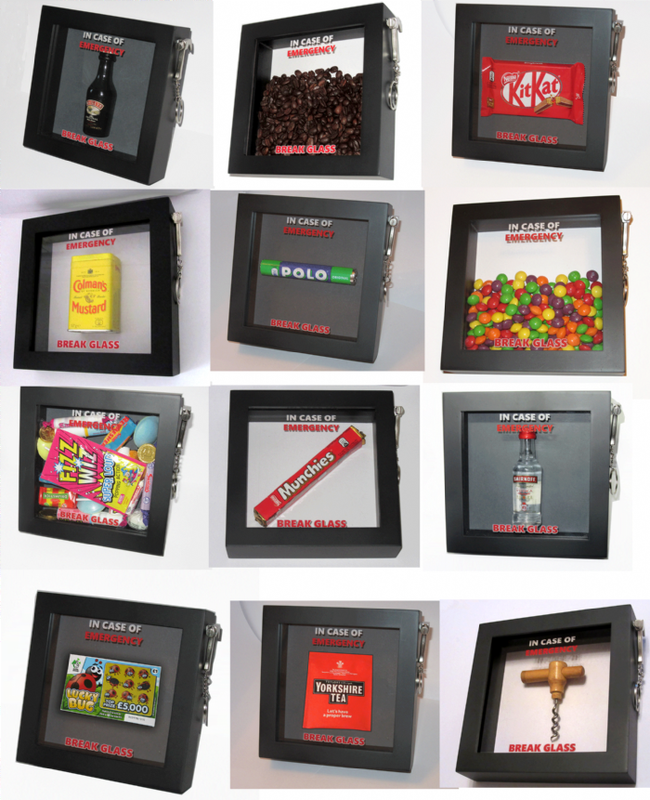 Check out our photos below for just a few ideas of what can be placed inside. To order please select any occasion from the left hand menu. Please note this is a Novelty Item made of acrylic and does not have to be broken to place or rescue an item. Sticky pads are provided to secure item/s. Frame measures 18x18x4.5cm. It will fit items up to 14x14x3cm. If you would like us to fill the frame with a specific item/s such as Chocolate/Sweets/Tea/Coffee/Food/Novelty or Small Item, please email us at Jemsideas@outlook.com and we will do our very best to do this for you at the best price we can. ; Excluding Money/Vouchers/Expensive Items or Alcohol (unless filled with water). Please be advised a pre-filled option will require longer preparation time and could take anything between 5-14 days. Before placing an order we will let you know what this option would cost along with expected delivery times upon hearing from you. Stuck for something to buy someone? Just fill with their favourite thing.....Food, Chocolate, Sweets, Drink, Money, Voucher or Gadget the ideas are endless!